The summer of 2013 was a very bad year for the monarch butterfly. All summer long, I thought it was odd that I never saw a monarch. Reasons are not 100% clear but impacts include weather factors, loss of habitat in the US and Mexico, increased traffic on roads, and the extensive use of Roundup on genetically engineered crops. Farmers spray Roundup on these crops, killing all the weeds but not the crop. The herbicide destroys milkweed upon which the monarch depends as a host plant. This summer I am doing my part to go a little more native. In addition to nectar flowers, I’ve planted native milkweed. 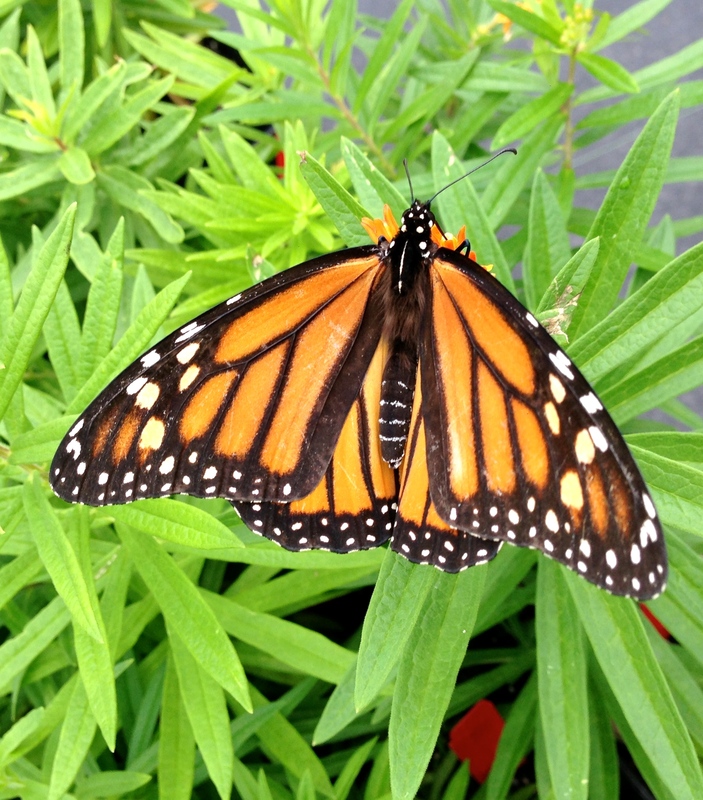 If the monarch finds my plants, I should have a monarch butterfly nursery. The plants will provide sustenance for the larvae.The blooms will provide nectar along with other nectar plants in the garden. There are different varieties of milkweed but I planted butterfly weed (Asclepias tuberosa) with its bright orange bloom. It should do well in hot, dry, sunny spot in the border. 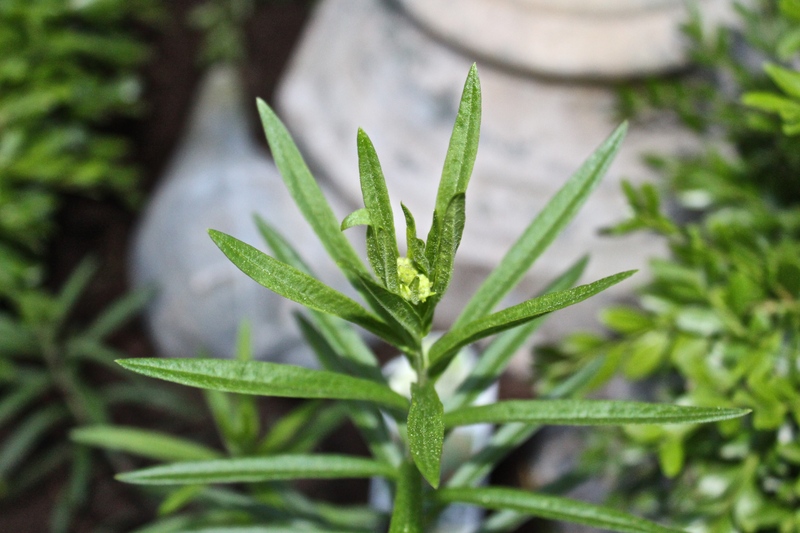 The hint of first blooms are appearing and I am checking my plants daily for signs of eggs. What can we all do to help? While we hope for more favorable weather conditions, we can all plant several milkweed plants in our yards along with the nectar plants to sustain both the larvae and the adult monarch. 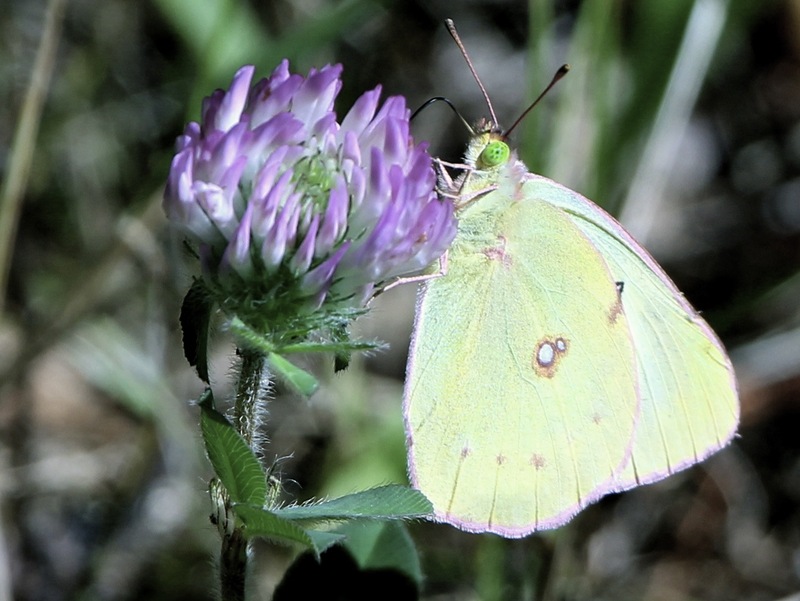 One of the most widespread and abundant butterflies in North America is the pretty little sulphur, We are all familiar with these yellow butterflies of the Pieridae family fluttering low over fields and open areas.The name ‘butterfly‘ is thought to have originated from a member of this family. 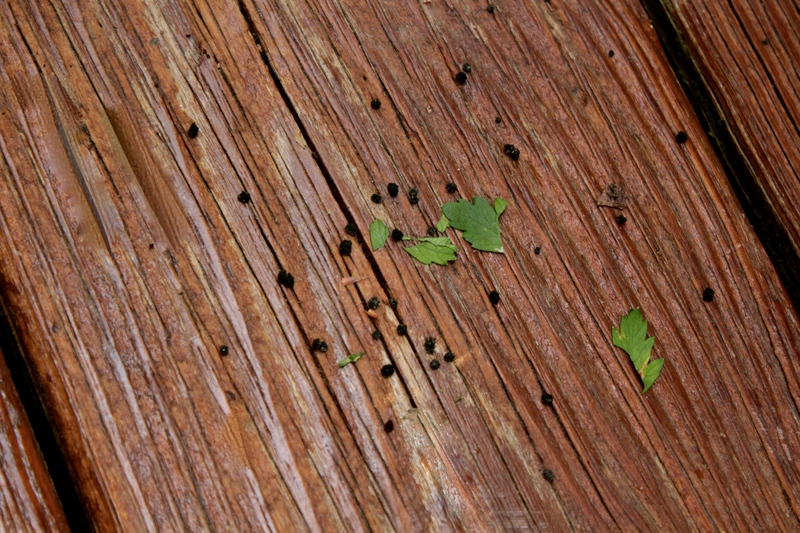 They are fast moving insects and I find them frustrating to photograph. The one I finally caught with my camera after many blurry attempts may be the Clouded Sulphur (Colias philodice) or it could be the Orange Sulphur (Colias eurytheme). They can be very tricky to tell apart… especially because hybrids between the two can occur. They perch with wings closed so it is difficult to photograph the upper side, which should have an orange flush if it is an Orange Sulphur. Sometimes black edging can be seen through the upheld wings and can help identify whether male or female. They seem to be everywhere at this time of year and are one of the last butterflies flying in late autumn. They breed from spring through the fall. 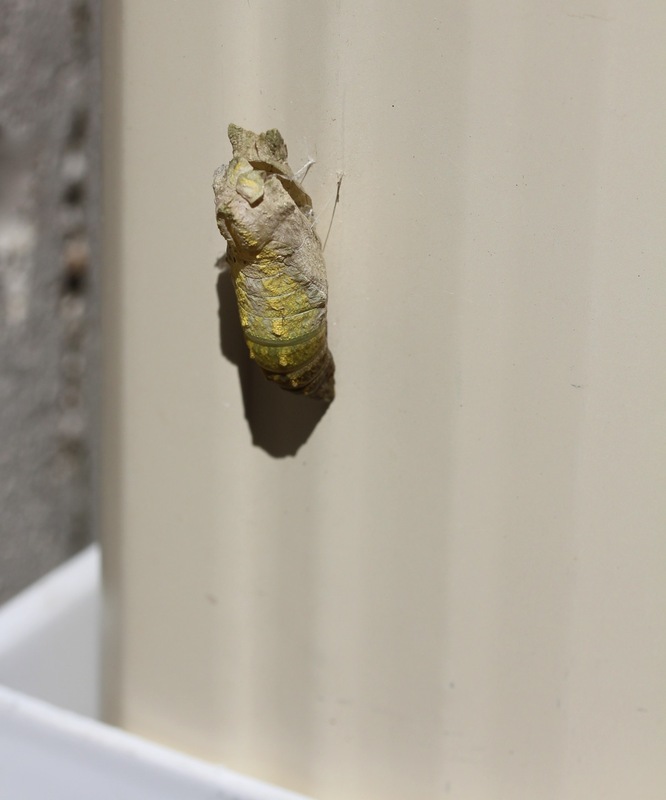 On average, they live for less than a week, however as the cold season approaches, the caterpillars overwinter in either the third or fourth stage or as a chrysalis. We will look forward to seeing them again in the spring as small pats of butter dancing over fields. On our morning walks, I love seeing rich pink flowers of ‘Queen of the Meadow,’ Spotted Joe-Pye Weed (E. maculatum). It is just coming into bloom along the paths we regularly take each morning. In the midst of Queen Anne’s Lace and Grass-leaved Goldenrod, the rich pink of the blooms and the deep purple of the stem clearly mark the native Joe-Pye as royalty. 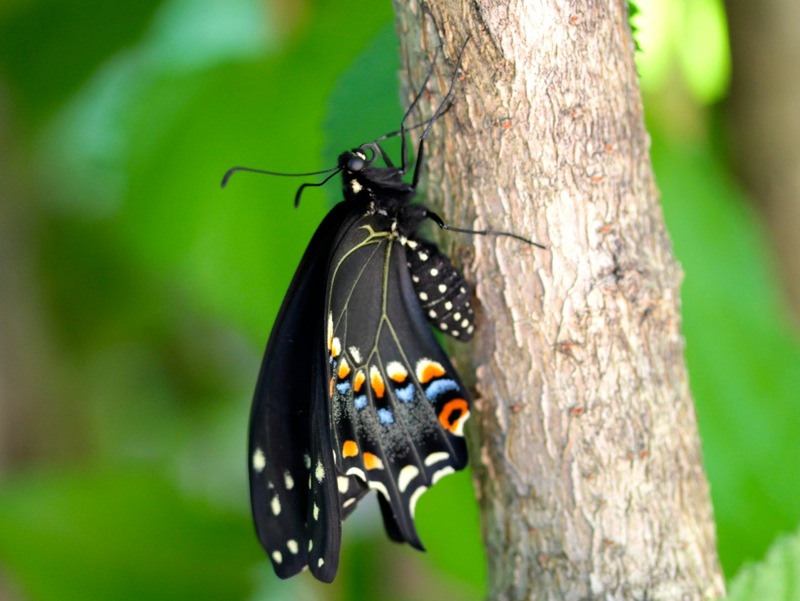 Among its subjects who present themselves to polish off some royal nectar are butterflies, including the swallowtail butterflies, Monarch butterflies, the skippers, plus all sort of bees, wasps and perhaps a hummingbird or two. Spotted Joe-Pye-weed, a member of the aster family, has ‘the widest geographical distribution and greatest morphological variability’ of all Joe-Pye weeds, according to the New England Wild Flower Society. A different variety grew with abandon in my mother’s Virginia garden but none of Joe-Pye grows in mine as it has a tendency to invade. I prefer to pay homage in meadows along my walk. The ‘Queen of the Meadow’ will continue to delight into fall. 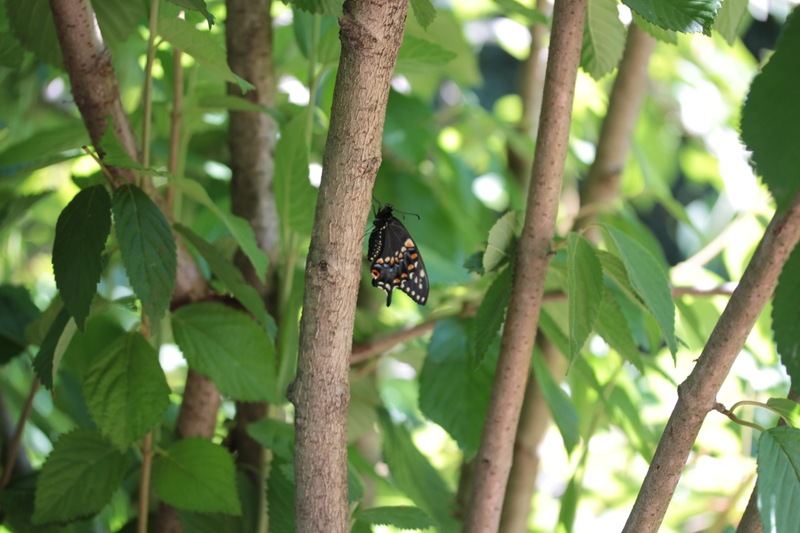 The leaves will fade from green to a nice lemony yellow and the stems remain a spotted purple shade. The blooms will fade to a fluffy brown seed head attracting goldfinches and other birds to dine. Actually, no one really knows for absolute certainty how the plant was named Joe-Pye but if you’re curious, click here to read one of the most interesting studies of who Joe Pye might be. 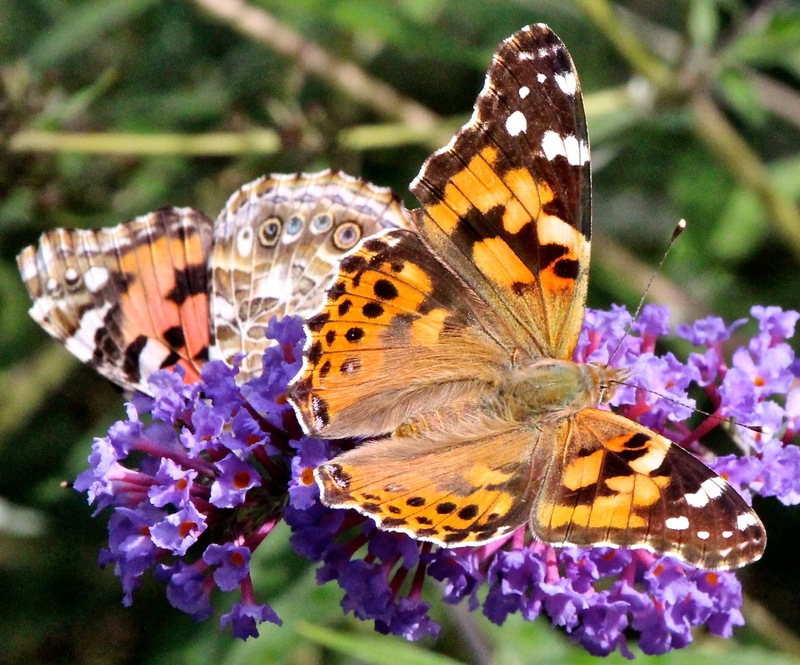 This butterfly is a world traveler: Painted Lady (Vanessa cardui) may be the most common butterfly as it is found on almost every continent. Male Monarch resting. Originally I thought this was a female but was corrected by Linda of socialbtrflies.com. The black dots on the hind wings are ‘scent pouches,’ identifying him as a male. Migration is underway. We’re beginning to see more of the monarch butterflies (Danaus plexippus) magically drifting southward on their August journey to Mexico. One of the few insects able to make the trans-Atlantic crossing, the East Coast monarchs winter in Mexico, then make the amazing return journey back each spring. Interestingly, monarchs only live a few short weeks and those born earlier in the summer do not make the southern journey. Those born at this time of the year, usually the 3rd or 4th generation of monarchs, are the ones to make that southern migration and survive the winter. It is amazing how instinct kicks in as a different butterfly makes the arduous journey each year, traveling up to 30 miles a day. Illegal logging in Mexico has reduced the winter habitat for the insect however the Mexican government has begun to crack down on this problem. What can you do to help the monarch butterfly? Plant milkweed, folks. 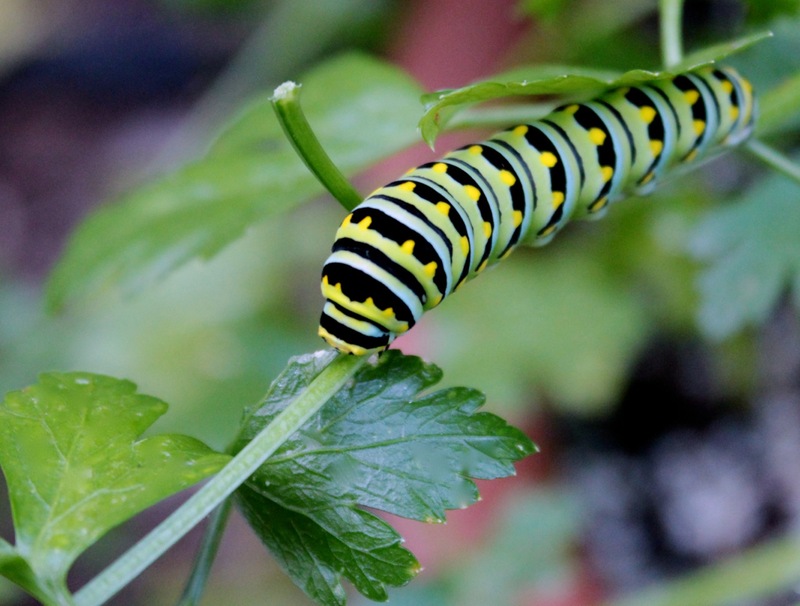 It’s the only plant the caterpillar can eat. 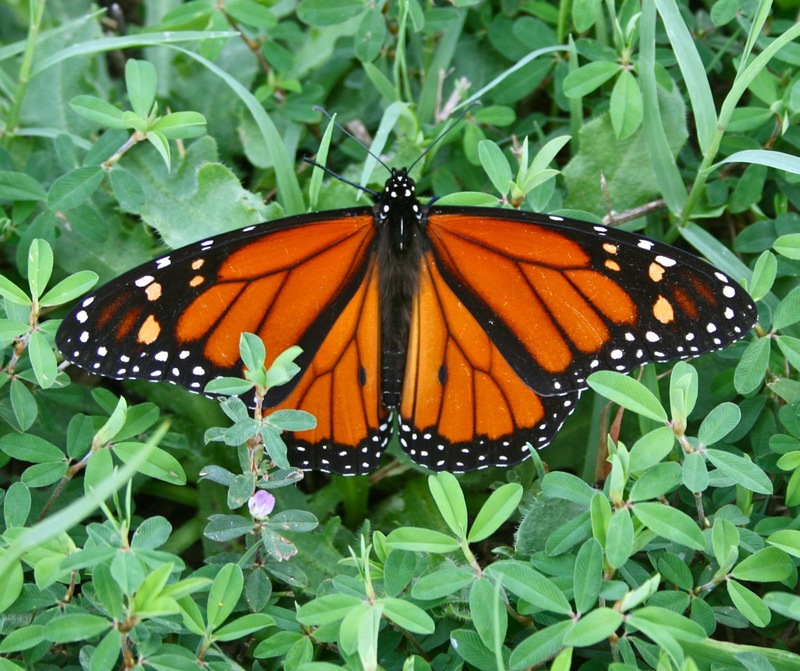 Due to toxins absorbed from the milkweed plant as a caterpillar, the monarch does not have many predators. The bright colors the butterfly wears is an advertisement that says, “I’m poison.” The viceroy butterfly has evolved to mimic the color and pattern of the monarch as a defense although it is non-toxic. If you spot a monarch butterfly fluttering by, there are websites that would like to keep track of your sightings. I report my sightings to Monarch Butterfly Journey North, a great website that provides migration updates with maps and provides excellent information on the life of this special insect.